In about 5,000 years, Betelgeuse is going to run straight into a line of dust (left). The red supergiant star Betelgeuse in the famed constellation Orion is on a collision course with a strange wall of interstellar dust, with the clock ticking down to a cataclysmic cosmic smashup in 5,000 years, scientists say. 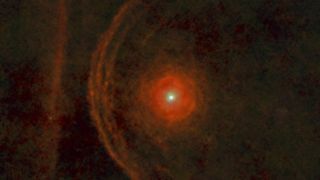 A new image of Betelgeuse by the European Space Agency's infrared Herschel space observatory, shows that the star will crash headlong into a trail of space dust while speeding through its part of the cosmos at a blistering 18.6 miles (30 kilometers) per second. That's about 66,960 mph (107,761 kph). Betelgeuse is a giant star that makes up the left shoulder of the Orion constellation and can easily be seen from Earth with the unaided eye by observers in the Northern Hemisphere. The star appears as a reddish-orange light above and to the left of Orion's belt. The new Herschel observatory image shows Betelgeuse as a bright disk surrounded by a shield-like arc of gas as it approaches an odd bar-like wall of dust. The curved "shield" formations to the left of the star are actually structures shaped by Betelgeuse's solar wind — the charged particles each star emits and blows out into the galaxy, ESA officials said. But the wall of dust the star will crash into may be anything, from a filament linked to the galaxy's magnetic field to a stellar cloud. Scientists do not think the dust wall is part of the Betelgeuse star structure. After the first bow of solar wind hits the line of dust in 5,000 years, Betelgeuse itself should run into the bar 12,500 years after that. Betelgeuse is about 100,000 times brighter than the sun and 1,000 times larger. If Betelgeuse was at the center of the Earth's solar system, it would extend out to the orbit of Jupiter, astronomers have said. In about 1 million years, when the star uses up its nuclear fuel, Betelgeuse will shed the last of its layers in a bright and violent explosion known as a supernova. The Herschel space observatory launched 2009 to study the formation of galaxies and how stars interact with its surroundings.